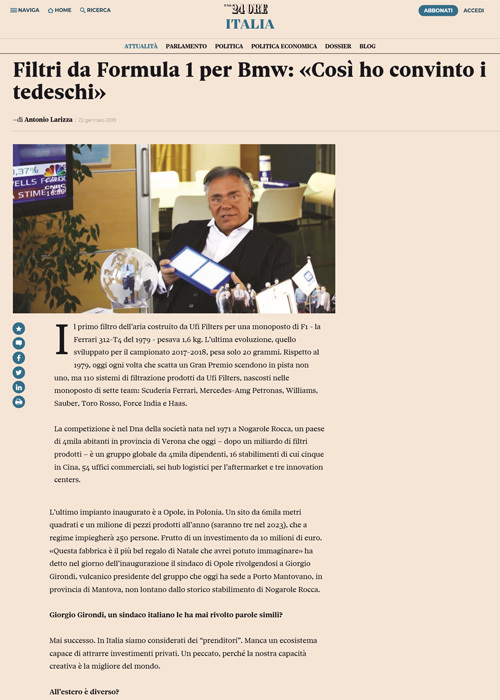 Interview to Giorgio Girondi on "Il Sole 24 Ore". The first air filter that UFI Filters built for a single-seater F1 – the Ferrari 312-T4 in 1979 – weighed 1.6 kg. The latest model, developed for the 2017-2018 championship, weighs just 20 grams. 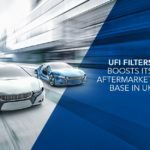 Nowadays, every time a Grand Prix takes place, not just one but 110 filters produced by UFI Filters are on the track, hidden in the cars of seven teams: Scuderia Ferrari, Mercedes-AMG Petronas, Williams, Sauber, Toro Rosso, Force India and Haas. Competition is in the company’s DNA. Founded in 1971 in Nogarole Rocca, a town in the province of Verona with 4 thousand inhabitants, today – having produced a billion filters – it’s a global group with 4 thousand employees, 16 plants of which 5 are in China, 54 commercial offices, six logistics hubs for aftermarket service and three innovation centres. The latest factory was inaugurated in Opole in Poland. A 6 thousand square metre site, where a million pieces are produced each year (increasing to three million in 2023), which will employ 250 people when fully operational. It’s the result of a 10 million euro investment. On the day of the inauguration, the mayor of Opole said, “This factory is the best Christmas present that I could have imagined” to Giorgio Girondi, the dynamic president of the group, which is now based in Porto Mantovano, in the province of Mantova, not far from the historic factory in Nogarole Rocca. Giorgio Girondi, has an Italian mayor ever said similar words to you? That’s never happened. In Italy, we are considered to be “borrowers”. We lack an ecosystem that is capable of attracting private investment. It’s a pity, because our creative ability is the best in the world. 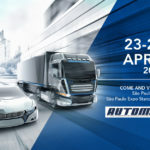 To be close to our clients, in particular VW, BMW, AMG and FCA. This factory will be our most advanced plant for production in the area of thermal management: the sector of heat exchangers for engines and transmissions. 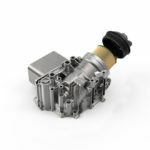 Also for electric and hybrid vehicles, where temperature management is crucial. In Poland, we will have our breakthrough in the electric sector, which I see as full of opportunity. Initially, the main client for Opole will be BMW, who manufacture a few miles away and chose us over German suppliers like Mahle and Mann+Hummel. How does it feel to beat the Germans? It gives us pride and satisfaction to show the Germans how filtration is done. It happened with the latest innovation as well, the Multitube air filter, which can increase engine power by 4%. When they tested it, the engineers at Porsche and AMG didn’t want to believe it. Today the system is standard in their cars. With a lot of research. But also through solid business relations built in China. What does China have to do with the German car industry? Do you remember what Mao Tse-tung said? If you want to conquer the centre of the empire, you need to control the periphery. I was lucky to have bet on China when no one else was looking there. In the early 80s, I introduced an entrepreneur who had links with the Chinese government to Gianni Agnelli: I took him to Fiat in Turin. In fact I was his driver. The man’s mission was to find a car manufacturer willing to produce in China. The market very small then, with around 350 thousand cars. Agnelli replied, in his manner, “Why should I come and produce in China? Do you even have roads?” Nothing came of it. The Chinese man went to Volkswagen instead. They gave him the moulds of an old model, the Santana, for production in China. Today, the VW group is the number one car manufacturer in China, the biggest market in the world. 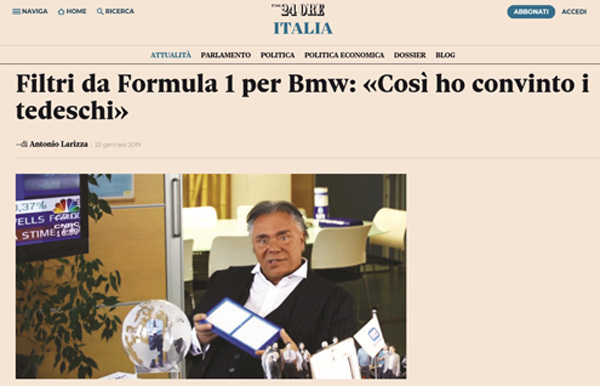 I accepted a proposal from the entrepreneur and, along with Rinaldo Facchini (the current CEO of the group – Ed. ), I set off for China to produce filters for cars. I stayed there for five years. As the Chinese car market grew, thanks to the advantage we had over our competitors, we became the first suppliers to the Chinese plants for all the manufacturers, including Germany’s VW, BMW and Daimler. First you conquered the periphery, then the heart of the German car empire. That’s exactly how it went (he smiles…). When you joined the company, to work your way up, UFI filters was a small Italian company. Today it’s an international group with a turnover of €436 million. 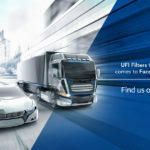 What’s left of UFI filters in Italy? 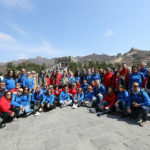 In Italy, we have our headquarters, several plants, a logistics hub and one of the three innovation centres (the other two are in China and India – Ed.). We relocate to follow our clients, but we also have strong links with our roots and to our ability to be flexible and to make quick decisions. That’s not easy for a global group like ours. That’s why I invented pit-stop meetings for my managers. Each participant, usually there are five, has to speak for 7 minutes. Then there is a 10-minute break, the pit-stop, where the group has to make a decision about the topic on the day’s agenda. In a meeting, there can be a maximum of two pit-stops. If no decision is made, the HR department gives negative points to the managers who have not decided. We must not lose the ability that smaller players have to move quickly and work as a team. Is that what you call the UFI DNA? Yes. I organise team building activities to infuse this in my colleagues. In 2015, we went to Dubai: we lived in the desert, in tents, moving around by camel. In 2016, we went to Cinecittà, shooting a film about the UFI story, where the managers were the actors. In 2017, I organised “UFI’s Got Talent”, a sort of corporate X-Factor. This year, we will have a gala dance in Warsaw. My generals must be united and happy. 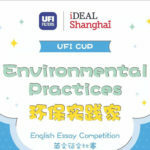 Many of them are also associates of UFI. If business is good, they make money too. This brings another advantage for me. I’m not the only one who doesn’t sleep at night, thinking about how we can continue to grow UFI. That’s the best guarantee for success.